Here’s a dark grey semi-solid suit that Pierce Brosnan wears in the 1986 episode of Remington Steele, “Suburban Steele.” It’s not a style for anyone to aspire to, except perhaps Timothy Dalton in Licence to Kill. It’s done in the same 1980s style, with large shoulders, a full cut, a low button stance, low-gorge and reverse-pleat trousers, but it’s better executed. 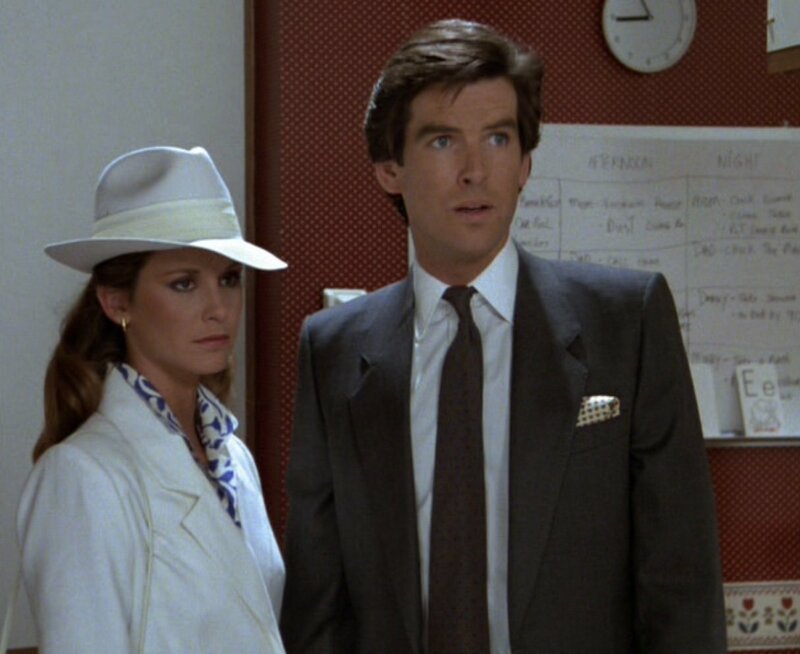 Pierce Brosnan was wearing mostly double-breasted suits in the later seasons of Remington Steele, but a few single-breasted suits stuck around. Though it’s not oversized in comparison to the suits in Licence to Kill, it still has a fashionably full cut. The jacket has a button two jacket with flap pockets, three-button cuffs and no vents. The lapels are a little narrower than Dalton’s, but they aren’t much better. The trousers have double reverse-pleats and plain hems. Brosnan wears a white English shirt with a moderate spread collar, double cuffs, no breast pocket and front placket. The tie is dark plum with red polka dots, tied in a four-in-hand knot. He wears a puffed pale yellow silk handkerchief with red polka dots in his breast pocket. The muted colour palate of the tie and pocket square are very much of their time, but the outfit is still well-coordinated. His belt and slip-on shoes are black. With a black knitted tie and white linen pocket square, Timothy Dalton could have worn a suit like this in Licence to Kill and brought Bond’s fashion into the 1980s in a more elegant and more Bondian manner. I wish I knew. It could be a ready-to-wear Italian suit with alterations, or it could have been made by a tailor in Beverly Hills. The earlier suits in the series were more likely bespoke and these Italian-style suits are ready-to-wear. It depends on how easy Brosnan was to fit. These suits really build up his upper body. His natural shoulders are very sloped, so it wouldn’t surprise me if they added extra padding to these shoulders. Thanks! That’s great to know. This could be one of the Boss suits or another fashion brand. The three-piece suits were probably the ones from Ralph Lauren. Man, there is so serious Dalton hate on this website. I know Dalton didn’t care about fashion and his clothes were generally ill-fitting and of poor quality, but I would think that his portrayal of Bond closer to the Fleming model would earn him a few fans from the old-school crowd here. I’m not saying I disagree with anyone on the merit of his clothing choices, just saying we might could dial down the bias and sarcasm a notch. On another note, Matt, would you consider a man’s hairstyle to be a part of his fashion choices? If so, wouldn’t it be fair to say that Brosnan’s “poofy” head of hair from this time period was just as “of the era” as Dalton’s full-fitting suits and (more importantly) totally wrong for his slim build? Dalton’s excellent acting has nothing to do with the way he dresses. None of my dislike of Dalton’s clothing has anything to do with the man himself. Whether or not you like his portrayal of Bond, it doesn’t make his suits look any better. You could say that hairstyle has a lot to do with fashions. I always thought Brosnan’s hairstyle in the 80s looked great. He still has the same hair in GoldenEye ten years later. It’s much better here than it was at the start of the series, which followed the helmet hair trend of the 70s and early 80s. The wider lapels, slightly lower gorge and generous fit emphasise Brosnan’s slight frame and narrow shoulders. Whilst the suit is better than Dalton’s, the style in general is not as kind to him. The idea of the full fit and large shoulder is to help Brosnan’s slight frame, and I think it actually helps even though it’s overdone to follow fashion trends. The Brioni suits he wears as Bond do the same thing, just not in such an extreme way. It’s still not as exaggerated as the Licence to Kill suits. This suit makes Brosnan look as if he’s wearing a set of parallel, vertical lines when the jacket is unbuttoned (see thumbnail #2). The low gorge coupled with the boxy shoulder padding ruins whatever could have been decent about the cut. Granted, it is far less offensive than most 1980’s tailoring. This is fairly nice, especially for a TV show budget and yellow pocket square notwithstanding. But to compare it to 1989 when this is three years earlier is not a fair comparison. Suits were rapidly becoming oversized as the 80’s drew to a close. Had their been a Bond movie starring Pierce or Dalton in 1991 and 1993, I have no doubt either would be wearing the oversized loosely fitted suits that were popular in the era. As for Pierce, his hair is cool, but his very slight frame shows to me at least why he shouldn’t have been cast as Bond in 1986. 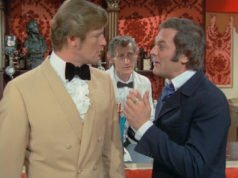 A Bond actor need not be Craig or Connery, but some physical presence is needed (like Roger in his earlier Bond films). I don’t really have much issue with this suit. The biggest reason is that at the time Brosnan probably weighed maybe 155 at the most. For a tall, thin individual the choices in the 80’s were not as varied as they are today. For a character that lives in Los Angeles and is somewhat of a Fashion forward individual, this was probably the only way to accurately make a suit for him that contained both the fashion trend of the time, as well as to help cover up the fact he was so thin. Dimension wise, it’s pretty well on the money. With those strong shoulders, if you took in the midsection it would look disproportionate and unbecoming. I agree with Christian that Brosnan wouldn’t have been that great as a Bond in the 80’s. Too young, too pretty, and not necessarily physically convincing in the role at the time most likely. It worked in the 90’s because the male physique had changed in terms of how it was viewed. 80’s was either a bigger average build (ie: Dalton) or steroid enhanced. Whilst today the fashion is for a thin man to accentuate how thin he is, in the 80 and 90s the fashion was to make a thin man look larger, like it was in the 30s-50s. Both methods have their benefits, though when taken to the extreme neither looks attractive. Brosnan’s suit is way overdone in the shoulders, though a natural shoulder wouldn’t do Brosnan any favours either. Not sure I’d agree with today’s fashion being to accentuate how thin you may be. I think that all comes down to the manufacturer. I do agree, a softer italian shoulder with a rope end would probably have been best for him, but based on the shoulder I would wager this suit was a off the rack Italian garment, and probably either a Valentino or a Versace. I entirely agree with you Matt about this trend which leads to accentuate the thinness. It’s really absurd. Being in this case, and having the same kind of physique as Brosnan here, I can testify that finding a proper suit that won’t make you look even slimmer -and thus really skinny sometimes, which I don’t think is attractive- is really a hard job. Every seller keep saying “you have the perfect physique to wear these slim suits”, but they just don’t understand that we don’t look like some kind of a skinny big tree when wearing a suit. If it wasn’t for Ebay, I guess I wouldn’t haveone single quality, flattering suit. Suits that bulk you up, like this one, are great for some physiques, it’s a pitty they have almost disappeared today. I wonder what Brosnan’s size is here. Perhaps a 38 UK ? I’m a little confused about this post…there seem to be contradictions to what has been said in other postings. You say of the lapels “The lapels are a little narrower than Dalton’s, but they aren’t much better.” So am I to assume that all of the Moore suits from the 70s are even worse? The lapels on those suits were far wider than this (you specifically allude to the width by using “narrower”) yet I seem to recall that they get a pass. 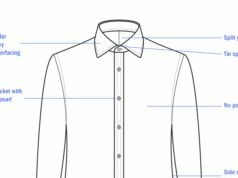 Then under the picture with a jacketless Brosnan it says “The shirt fits very well.” I’m really confused by that – the shirt is clearly pulling horizontally at the uppermost fastened button despite the unbuttoned part being open quite wide. As well, there seems to be far too much extra material at the waist, especially in the left side of the picture – Brosnan looks like he’s going to pop a button at the chest but is swimming in his shirt at the waist. Given the reaction to Craig’s “too tight” look for Skyfall and to Dalton’s LTK suit in a recent post this post almost gives the impression that the rules of fashion amount to “who is right” instead of “what is right”. I never said that Moore’s lapels get a pass. I just think the suits overall have more merit than Dalton’s Licence to Kill suits. There is much more to a suit than the width of the lapels. Moore’s lapels and Dalton’s lapels I find equally bad for different reasons. Dalton’s lapels, and Brosnan’s here, have a low gorge that looks just as dated as Moore’s wide lapels. About the shirt, forgive me, I was looking at the show rather than the screenshot I put up. I chose the wrong screenshot for the shirt, and I’ve attached a new screenshot that shows there’s actually a little slack in the chest. And the shirt isn’t swimming in the waist, it’s just coming out of his trousers because of the unnatural way he was moving around earlier in the scene. He raises up his shoulders, pulling the shirt halfway out of his trousers. If you’d like, I can post a Remington Steele outfit or two that makes me prefer Dalton’s clothing in Licence to Kill. There are quite a few horrible outfits in that show, like a double-breasted suit with a very low button stance and low-gorge notch lapels. And there’s an episode where Brosnan wears a belt and braces at the same time. Dalton never reached that low. The new pic certainly makes it look like it fits better, although I wonder if a shirt that was too tight would look better once you’re bent over – less strain on the fabric, it would seem. I think it would be interesting to have *both* pictures up, just to show how simple movements can make an outfit look so different. Sometimes we forget how much primping and preening goes on behind the scenes and can get frustrated with the lack of…crispness in our real-life wardrobes. Nice to know that even TV stars look out-of-sorts at times! 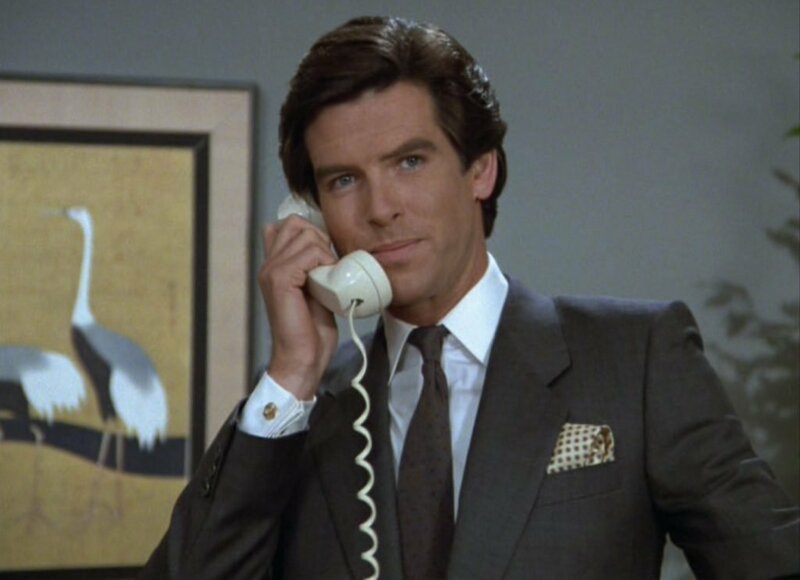 As for posting suits from Remington Steele that are horrible I don’t see any point. To me, the great thing about style is the positive, not the negative. I certainly enjoy reading different opinions (not unquestionable truths) about clothes and can appreciate an outfit that I may not like for my personal style – like a silk cravat with a heavier sweater – based on another poster’s opinions. Actually, I guess I do see the point – some people who post in the comments here will always enjoy bashing an actor or a style they don’t like (really? that’s where it’s important to expend your energy?) and the ensuing back-and-forth will increase page views. As for the notched-lapel double breasted jackets I well remember them – didn’t Alan Rickman wear one in Die Hard? The question that I’m really curious about – when do you think they’ll come back in style? Because EVERYTHING will come back around eventually. You see the point indeed. Alan Rickman’s suit was like that. But it was also better-tailored than Brosnan’s example. Moore actually wore the style in Moonraker and it looked pretty awful. I’ve seen a recent runway example of a notch lapel, double-breasted suit. It may come around again, but it won’t be a the big thing that it was in the 80s. I don’t think everything comes around again. It’s the extremes that don’t. Double-pleated trousers will surely be back in fashion one day again, but I don’t think the triple—and definitely not the quadruple pleats—that were popular 20 years ago will again. 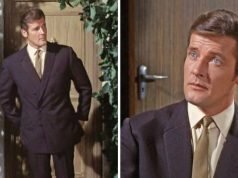 Wide lapels and flared trousers may come back, but they won’t be as extreme as on Roger Moore’s suits in the late 70s. Tom Ford and Ralph Lauren have tried to push the wide lapels just in the last few years, but they didn’t catch on. What new thing is next? Tailored fashion now is a complete reversal of what it was 20 years ago. In 20 more years the balance will be upset another way. I was looking at a preview of next spring’s Ford and RL stuff and it seems like they’ve abandoned the wide lapels. Do you think they’ve given up? I actually prefer a wider lapel to the current skinny variety. Armani had a triple pleated pant for the spring. Matt, didn’t Emile Loque wear a double breasted light grey flannel suit with notch lapels in the Madrid scene (to warm..?) in FYEO? I’d love it if you did a post on that suit. It was pretty interesting. It had black buttons and patch pockets I think. And it did what Brosnan’s suit here was meant to do. It built up Michael Gothard, who was also tall and thin, but it fitted so much better than this suit. Matt, you might consider subjecting the British TV series The New Avengers to sartorial analysis. The show, which ran for two seasons in 1976-77, revived the character of John Steed from the original Avengers and gave him two sidekicks, Mike Gambit (Gareth Hunt) and Purdey (Joanna Lumley). In general, Steed dressed somewhat more conservatively in the 1970s revival than he did in the 1960s original (or perhaps his dress seemed more conservative in the mid-1970s). But Gambit’s suits resembled those of Roger Moore’s Bond. You can watch episodes on YouTube. I am a bit late to comment on this post, but the subject is really interesting, and everybody has good points to make. Here are a few thoughts. -First, Brosnan looks really good in it. The suit doesn’t really scream 1980’s. With the exception of the handkerchief pattern, it looks still very decent today. I am just not mad of the shoulders -their width looks correct but they are almost horizontal. Even Brioni’s are not so ‘square’, at least now. The shirt looked quite slim fitted (strange with a full cut suit thought )in the first picture posted but now it just seems normal thanks to the change. I would wear this suit with no problem today, the jacket’s cut is pretty much my version of an ideal two-button jacket by the way. -Then I have a hard time finding what makes a low gorge and a low button stance dated. Perhaps it is when it’s done in an extreme way, like the LTK charcoal suit, but here I am not shocked. Perhaps it’s because the lapels are a bit slimmer than the LTK charcoal suit’s ones here. They don’t look fairly dated to me. But perhaps the gorge isn’t as low as the 1980’s stuff that Matt has already covered, I can’t tell. Lots of 30’s -40’s suits had these two features too. Anyway, perhaps it’s because I just bought a suit with these features that I react this way. -Finally, Matt, I would like to have your opinion about what kind of cut a thin and tall man should choose. Do you think a full cut -draped or not- with double pleated trousers is recommanded, or that it’s better to stick jackets cut close to the body and flat front trousers ? I have some trouble to make my decision about that. 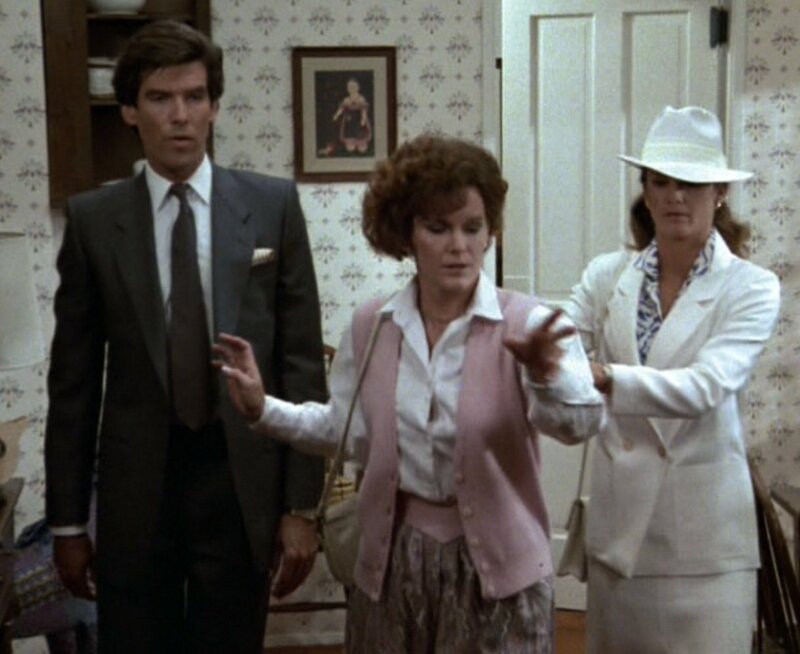 The steep angle of the lapel notch in Remington Steele is really what makes it look dated to the 80s. I think the traditional English cuts looks great on a thin and tall man. The military cut and the drape cut both give the thin man a little more presence, but in different ways. I think single or double forward pleats are great, but well-cut flat front trousers can work well too. As long as the suit fits properly, a thin man can look good in almost anything. I see what you mean about the lapels, Matt. Like some shoulders, they are sloping, even falling I dare to say. Could this be a full chest but without drape ? So, a “full but clean chest” ? It’s clean, but not especially full. Were you only talking about the trousers then when you said that the suit has a fashionably full cut ? It has full-cut trousers, but it isn’t cut closely around the waist either.